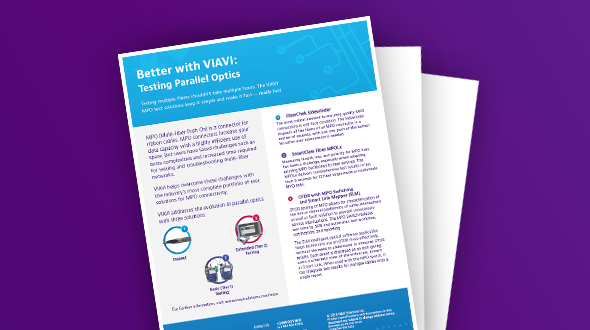 VIAVI helps overcome these challenges with the industry's most complete portfolio of test solutions for MPO connectivity. While MPO connectors have many benefits and advantages over typical single fiber connectors, there are also differences that introduce new challenges for technicians. This video series provides an overview of essential information that technicians should understand when testing multi-fiber connectors. Each episode will address a key topic surrounding MPO connectors. 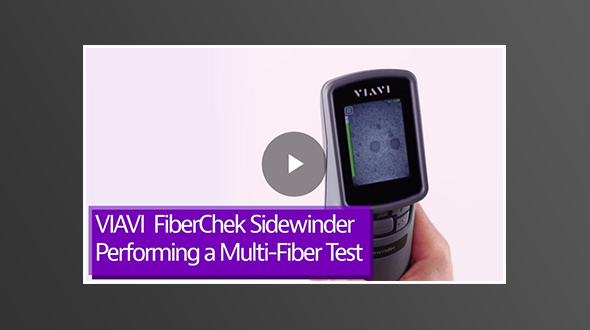 Tyler Vander Ploeg: Hey everybody, I'm Tyler from VIAVI Solutions and I'm here with my colleague Matt Brown, and we wanted to talk a little about multi-fiber connectivity, and more specifically, how to do MPO connector testing. Now it's something that's been around for a very long time but Matt has been along around for the ride since the very beginning, so I wanted to bring you in Matt to talk a little bit about this and give some more depth to our viewers about what these connectors are, how they're different and what they should be keeping in mind as they're starting to experience these in the field. Matt Brown: Sure, so almost from the beginning, not really from the absolute beginning but MPO has been around for a long time. It is a multi-fiber connector, so what is an MPO? It's a connector that has many fibers on that single connector as opposed to a Sam Charlie, which has one fiber on it or an LC, which has one fiber on it, and even you duplex them, again there's still this one fiber on each of those connectors, so an MPO is a connector that has many fibers mounted on a single ferrule. It's been around for a very long time. It's been in our networks for a very long time but it's been in a place where we don't have to deal with it or a regular technician doesn't have to touch it and manage it on a daily basis because it's been behind the panel, providing rapid connectivity of dense trunk cables and converting them into an LC form factor or elsewhere on the back plane where we don't see it. Matt Brown: Now with a number of trends that are happening, we're really seeing that the MPO is starting to come up from behind the panel and it is on the panel and you have to deal with it so the technician is out there going what is this adaptor? What is this big rectangular thing? It's not a Sam Charlie, it's not an LC and then he gets the jumper and it's got pins on it. What thing is that? How am I supposed to put it in there? It's got this key on it. There's just a lot of things that are very different about the technology. It's a very good technology, it's a very powerful technology but it has some things that are different that we have to deal with, so that's what we should be talking about in the next series of videos. Tyler Vander Ploeg: Yeah, perfect. Glad to have you here, Matt. We're over the next couple of videos, we'll be talking about all these things that Matt just talked about so look forward to having you with us on these. Thanks a lot. Tyler Vander Ploeg: Hey everybody, I'm Tyler. Tyler Vander Ploeg: And we're with VIAVI Solutions. And in this episode, we wanted to take a closer look, specifically, about the challenges of contamination with MPO. Matt Brown: Yeah. So there are many... a lot of things that come into play. Right? So, the first and most obvious is that with a traditional connector or an LC, you've got this ... you have this ceramic split sleeve that's in the adapter. And when you walk up to a panel and you pull that dust cap off, you can see that there's a little tiny hole. That it's a 1.25 millimeter hole that the LC connectors going to go in to, the ferrules going to go in to. If you look at an MPO on a panel, it is a giant rectangle. Right? It is a very big area. Matt Brown: So there's just way more access and way more area for contamination to get into the interface. And right, even if you just look at the two things in your hand, the little tiny LC ferrule, which a lot of people get confused, is like, is that the fiber? No. That's a ceramic ferrule that holds the fiber. On the MPO, you've got this black rectangular ferrule that holds many fibers. So there's just a lot more surface area here for contamination to get into place, and a lot more access on the bulkhead side for contamination to get in there. Matt Brown: The other thing that's going on is that there is one fiber on here. There's a small 1.25 millimeter fiber at the center of that 1.2 millimeter ... 125 micron fiber in the center of that ferrule. There are 12 or 16 or 24 fibers on that ferrule. So probabilities are power functions. So if we say that there's 90% chance ... there's a 10% chance that that fiber is dirty, which means there's a 90% chance that it's clean. Well if we have 12 of them in a row, you take that 90% chance as good to the 12th power, that's how you add up the probabilities, and you get something like 30% chance that all the fibers are clean together. That all those fibers, together, are clean is way, way more unlikely than this one fiber, by itself, is clean. Matt Brown: And add those things up and what you get to is that they're contaminated. I mean, we know from personal experience, you go out into the ... into an installed base and the connector's been in the panel for a long time, there's this high likelihood it's going to be contaminated. With MPO, it's just ... it's almost a certainty that that thing's going to be contaminated. What is that ... why do we care? It goes back to the, inspect before connect, model that we have. Debris and contamination on the endface mess up the transmission. It's true for an LC. It's more true for an MPO or and MTP connector. Matt Brown: Because just like on the fiber on an LC, if there's dirt or debris or contamination in the core, it's going to mess up the transmission. Same on an MTP. If there's dirt or debris outside the core, on the fiber or on the ferrule, it may not get in the lightpath, but it can stop the two things from coming into physical contact. And we need those fibers to touch each other. We need those two fibers to physically come into contact and there's no air, there's no daylight. With an MPO, you've got all these fibers in this array, and they're all coming together. And if one of them gets blocked, the neighboring ... if one of them is prevented from physically contacting, the neighboring fibers can also be prevented from physically contacting. Matt Brown: We know it. We have a theory on it, a model on it, and then we've demonstrated. We've tested it. We know that contamination over here prevents physical contact on several neighboring fibers. So way more likely to be contaminated because there's just more area. Way more probable that 12 things are contaminated ... 12 things are much more likely to have one of them contaminated than one. And if the contamination exists, it's going to impact neighboring things. So it's this huge issue. What do you do about it? You inspect it. I mean, you see what's going on. You clean it. Right? You absolutely have to have a good cleaning solution. A designed for fiber optic conductivity cleaning solution. Tyler Vander Ploeg: Mm-hmm (affirmative). Matt Brown: Been around for a while. We used to have Kimwipes and IPA. Right? And that was our cleaning solutions. Not so hot. Or people used to clean with not designed for optics. And bad cleaning solutions will scratch or damage the endface. So use something that's designed to do the job. And you have to verify it. Tyler Vander Ploeg: Inspect it again. Matt Brown: You have to. I mean, it's what Regan said, "Trust but verify." Right? I trust the cleaning tool, but I have to verify that it did its job. 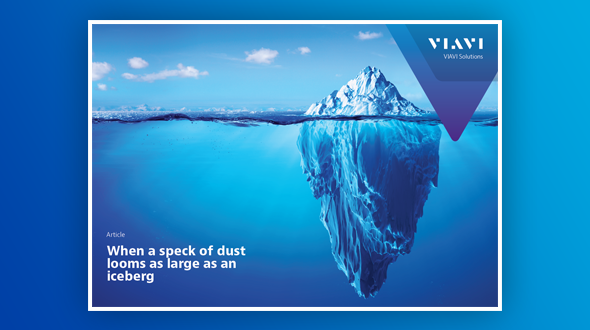 Especially with all these fibers, there's just so much going on on there that we often, even with very good cleaning solutions, find that a first clean something gets moved, something gets left behind. And you just have to check and see that it's clean. Once you see it's good, you're safe to connect. That connection's going to be good for the lifetime ... for as long as it's plugged together. Right? Matt Brown: The good news with optics is once you put them together, they stay good. Matt Brown: Until you mess with them. Tyler Vander Ploeg: Yeah. Appreciate it, Matt. Thanks again. Tyler Vander Ploeg: For more information, you can reach us at viavisolutions.com/MPO. Thanks a lot. Tyler Vander Ploeg: And we're with VIAVI Solutions, and in this episode, we're taking a closer look at some of the challenges with polarity for multi-fiber connectors. Matt tell us a little bit, we've heard this term a lot with polarity even with single fiber connectors, tell us a little bit more about what that's all about. Matt: Yeah, so polarity is essentially making sure that the transmitter on one end of a link is connected to the receiver on the other end of the link, and the transmitter on the far end is connected to the receiver on this end. If my transmitter's talking to that transmitter, there's not a link, right? The link isn't up. Nobody's receiving the data. So, it does exist in duplex connectivity, and a duplex LC is usually used to connect one SFP to another SFP, because one's talking one direction and one in the other. Those can get messed up. Right? A lot of people would know from personal experience that you can get those two lines flipped. It's relatively easy to fix. It can be troublesome, but you can find it and you can fix it. Matt: With MPO, it just gets really complicated because I don't have one fiber on this connector and one fiber on this connector. I've got 12 or eight or 24 fibers locked into position on a connector, and I can't change it. So, with MPO, I may be putting different traffic down each pair on that 12 fiber. That 12 fiber MPO may be six separate channels. Or, it may be one that's talking on these four fibers, and listening on these four fibers. So, it can be used in a bunch of different ways, and maintaining that transmit connected to receiver, receiver's connected to transmitter, transmit each of the transmit fiber's connected to the right receivers on the other side, and vice versa becomes really complex with MPO. Matt: The right listener. And there are many different ... Again, you can have many different channels, one channel, you can use MPO for ... It's complex. So, we standardized this a bunch of years ago, so you're going to hear about these Type A, Type B, Type C polarity. So, what that is, is a defined methodology of building the link. MPO's even more complex because not only is it where all the fibers, the MPO is a key that controls how the fibers are connected from one connector to another connector. Matt: So, if you've got this key up on this side, key down on this side connector, this MPO comes in like this, this MPO comes in upside down, this fiber gets connected, pinky fiber gets connected to index fiber, right. If I'm key up to key up, pinky fiber talks to pinky fiber. None of them are wrong. They all have solid design behind them to assure that the link connects the right fiber on this end to the right fiber on the far end. But, if you mix up ... But they all use different components. And if you mix the components up, you will scramble the signals going off in all kind of different directions. So it's very easy to get wrong. And, you can't figure it out. Matt: So we look at a duplex LC talk to two SFPs, you're connected through, you're trying to plug them up, it's not working. You call your buddy on the other end, he puts a VFL on one his transmit side, you look and you go, "Oh. It's coming out on my ... I've got my connectors flipped over." So you kind of flip your LCs around, plug them in, you've fixed it. Tyler Vander Ploeg: It's easy. Yeah. Matt: You can't fix it on MPO because you can't move the fibers. You can't even figure out what's going on because you shine the light on MPO on this side, it's just coming out of all the fibers on this side. Matt:So there's no ... You can't like look and say, "Oh, you're on fiber number two. You can't tell. So, vendors out there sell systems that are really heavily designed to go in and work right on the first time. And so on an initial build, when you're building out, you're using all the same vendor's stuff, you're using all the right part numbers, the other part is you have to get the build right. You can easily ... If you mess up on what you're ordering when you put the slate together, unfortunately, "Oh, I got one of the wrong cables in place and it flipped everything over." So, ordering wrong can impact it, but usually that initial build goes fine. Matt: ... years ago. Now, are you getting the right patch cords? So, there's a lot of ways for it to go wrong. Tyler Vander Ploeg: You brought up something really interesting. And this is a scenario where we're seeing MPO used a lot, is it was an investment that they made several years ago in an architecture that was for an easy plug and play rollout, and now they're saying, "Hey, I can still use this multi-fiber architecture as I'm migrating say up from 10 Gig to 40 Gig. But the challenge now is like you just described. Hey, I don't know what kind of polarity I have. Matt: Talk about pins in another video series, that comes into play, so again, MPO's just is very complex. So, the takeaway is that you need to test it. Right? If you're building on an MPO link, you need to verify that that link has its correct polarity. It's in 568. I mean 568 since the days of this duplex connectivity side. One of the things you're verifying with this test is lost length and polarity link, you're routing correctly. So, you have to test it when you're building a link. You should be able ... If you're going to troubleshoot one of these links, you should have a tool that can identify one line on the MPO from another line of fiber on the MPO. Matt: And so, there are very few tools out there that do that. You need a light source and a power meter that have MPO ports on them, and can individually determine, I'm sending you power on line two, I'm receiving the power on line four, oh that's wrong. Or oh that's what I expect. That's how this thing is now done and built. You need an MPO designed test tool that can verify that polarity if you're going to know what's going on. because really you can't do it visually. You can't do it with a VFL, you're kinda in the dark. Tyler Vander Ploeg: Yeah. Makes sense. Well, thanks again Matt. Until next time, I'm Tyler. Tyler Vander Ploeg: And you can find out more information at viavisolutions.com/mpo. Thanks for watching. Tyler Vander Ploeg: Hey, everybody. I'm Tyler. Tyler Vander Ploeg: And we're from VIAVI solutions, and in this episode we're talking specifically about the challenges of alignment for MPO connectors. Now, with a typical simplex fiber, it's pretty simple. Matt: Right, that cylinder gets connected to the other cylinder on the other side in a split sleeve, right? So these two things get lined up and aligned. With MPO we've got this array of fibers and we don't have a split sleeve. We have nothing but a wide open channel in the adapter. So, how do MPOs do it? Well, one MPO has to have pins, and the other MPO has to not have pins. So the guide pins on the one MPO go into the guide holes on the other MPO, and that aligns the twelve fibers. Matt: So, if you've got a pinned connector and you're trying to plug it in to a port that has pins in it, it's not going to work. The thing won't latch in. If you've got an unpinned and you try and connect it to an unpinned, it'll go in but you'll get terrible losses and you'll probably damage the fibers. So, you better have ordered the right gear, or you're not going to be able to plug your link up. And they can't be changed in the field, right? You're stuck with this. You ordered this, this is what you got. Tyler Vander Ploeg: So this introduces a lot of challenges when it comes to testing. Matt: Yeah, for sure. One is that my MPO tester needs to be able to plug in to either pinned ports or unpinned ports and test whatever I need it to test. The other is in reference verification, so we're using duplex LCs or Sam Charlies on a simplex or duplex tester, I'm used to verifying that reference condition by taking my light source with its lead and plugging it into my power meter with its lead, and just checking that. Matt: Just baseline. How's my baseline? Okay, I'm good. With the MPO, if I've got two unpinned MPOs, I can't verify the reference. So now I have to put a third cable in the place, a pinned cable, and I can verify the reference but it's a little more complex and people aren't used to doing it, so it tends to confuse a guy who's used to validating his reference on a simplex tester. Tyler Vander Ploeg: But there's some new solutions on the market now, right? Matt: Yeah, good news. I said you can't change them in the field, and you can't with these legacy guys. Our friends at Panduit have solution at Pam MTP that can ... Its pins can come in and out, it can change itself. Our friends at US Conec have a solution where they have a new connector that you can add pins or remove pins safely in the field. So there's good news that now we've got the ability change it. But mostly, you're going to have to pay attention. The big message is pay attention and look at what you're plugging into each other, because you can damage your connectivity. Tyler Vander Ploeg: Perfect. Hey, thanks again, Matt. I appreciate it. For more information you can find information online at viavisolutions.com/MPO. Thanks for watching. Tyler Vander Ploeg: Hi everybody. I'm Tyler from VIAVI Solutions. And in this episode I'm talking with Ed Gastle. He's our product line manager for many of our fiber optic test equipment. And he also oversees many of our MPO test instruments. So I wanted to have some time to talk with him a little bit about the different portfolio that we have and what testing is used and when. So Ed, thanks for being on with us. Tyler Vander Ploeg: So tell us a little bit when it comes to MPO testing, I know it's been around for a long time, but a lot of folks who are getting into this are asking, okay, what do I need? What kind of test equipment do I need for MPO? Ed Gastle: MPO testing is not that much different than regular duplex fiber testing in the sense of what tests need to be performed. Obviously the testers are somewhat different. So for the test that you need to perform, you've got your straight on inspection of the fiber end faces and of course it's typically a 12-fiber fair that you have to inspect. You've got your tier one or basic fiber certification, which is your loss, length and polarity. And you also have your tier two or your enhanced testing, which is performing OTDR tests so that you can really see each individual event in that fiber link. So that's really, it's the exact same that you would see for duplex testing. It's just that your tools have to be different because you've got a different fiber connector, being that MPO connector. Tyler Vander Ploeg: Great, yeah. So we've talked a lot, obviously, about fiber inspection on other episodes and such, but I want to ask a little bit more about when it comes to, you talked about length, loss, and polarity, differentiating when to use a typical MPO to MPO test versus maybe, I know there's applications where MPO is a subset of a greater link. Can you talk a little bit more about when you'd need to use direct MPO testing versus others? Ed Gastle: Yes. So this is, MPO really has been in networks for quite some time and it's been used as a backbone or a trunk. When you have that backbone or a trunk, then you'll typically have something like a cassette to break down into individual LCs. And those, that still exists and that will get you up, in today's world with multimode, will get you up to 10 gig. If you start to go beyond 10 gig, then you start to need to have different types of connectors out at the end. So that's, this is your cassette. You've got your 24 fibers coming in at the back through MPO, and these need to be inspected. But then your test is done with a classical LTS by testing each of the individual LC drops. So in this case you really don't need to test the trunk assembly. If you do need to troubleshoot it, that's where an OTDR would come into play, and then you can look to find out where a specific fault is. But typically with those trunk assemblies, your issue is your connections that you have, the MPO connections. Ed Gastle: So then when things start to get different is where you're running at, especially with multimode, 40 and 100 gig, and there are systems like PSM4 for single mode that also run what I would call native MPO right into the equipment, whether it's a switch, a router, a server type of thing. And for that, then you need to start having native MPO interfaces on your test equipment which allow you to test those links and channels. So that's what the, in this case, the MPO LX does, is your basic or tier one certification, your loss, length and polarity. And it's done really much the same way that you would do with an OLTS on LC links. As you do a set reference. You set a limit and then you connect up to your system that you're testing. You perform the test. You get pass/fail. Except you're doing a pass/fail on 12 fibers now instead of two. Tyler Vander Ploeg: Gotcha. Okay. So very similar behavior. It's still an optical loss test set. Tyler Vander Ploeg: Now, and you said this is more prevalent when you get into that 40 gig, 100 gig with QSFPs and such. Ed Gastle: With QSFPs, where you've got that direct QSFP or MPO connection into your switch and servers. That's where you need to be, now your link itself, instead of being a duplex LC, your link is an MPO. Typically a 12-fiber MPO. And that's why you need to test that length with native MPO testing. Or you can test the channel as well. Disconnect from the QSFP plugged into the switch, server, router, whatever, and then test the channel. Tyler Vander Ploeg: Okay. You had briefly mentioned the tier two or enhanced testing as well. Finding out more information. How do you, can you talk a little bit more about some of the new technologies with being able to test an MPO individual lanes with an OTDR. Ed Gastle: So with our 4000 platform, we have a switch module for it. So your OTDR is still a simplex connection, but the simplex connection goes to the switch and the switch gives you that 12-fiber MPO out and because the MPO switch module and the OTDR module are both on the same device, it's really automated. So you say what you want to test. I want to test all 12 fibers. You hit start, and the OTDR tests fiber number one. The switch switches to fiber number two. Test fiber number two, and so on. Ed Gastle: So you just start it, step back and let it go through all 12 fibers in a, by stepping through with the switch. Ed Gastle: Correct. And with modern OTDRs, you're, certainly the 4000, is that you're then seeing a schematic view so that you see what the events are and which events have a problem with it instead of having to read a squiggly line on a screen. Tyler Vander Ploeg: That's perfect. Well, hey, thanks again for joining us, Ed. You also recently wrote a white paper. Tyler Vander Ploeg: That goes into great depth on this. Tyler Vander Ploeg: For more information and to get that white paper that Ed wrote, you can visit us online at viavisolutions.com/mpo. Thanks for watching. MPO Switch - OTDR testing of MPO allows for characterization of the link or channel (uniformity of cable attenuation) as well as fault isolation to prevent unnecessary service interruptions. The MPO Switch reduces test time by 50% and automates test workflow, certification, and reporting. Smart Link Mapper (SLM) - The SLM intelligent optical software application helps technicians use an OTDR more effectively, without the need to understand or interpret OTDR results. Each event is displayed as an icon giving users a schematic view of the entire link, known as Smart Link. 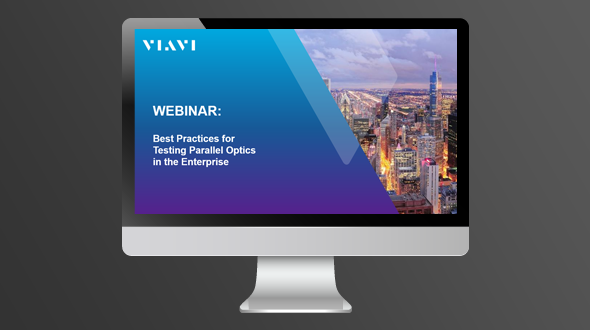 Learn best practices for testing MPO connectors in the enterprise. A Fiber Connector is a Fiber Connector… or is it?